Another one! *facepalm*. This picture is taken in Kroger. WTF?! I think Twihards really shoudn't be let to display the books in a bookshop. Newsflash! 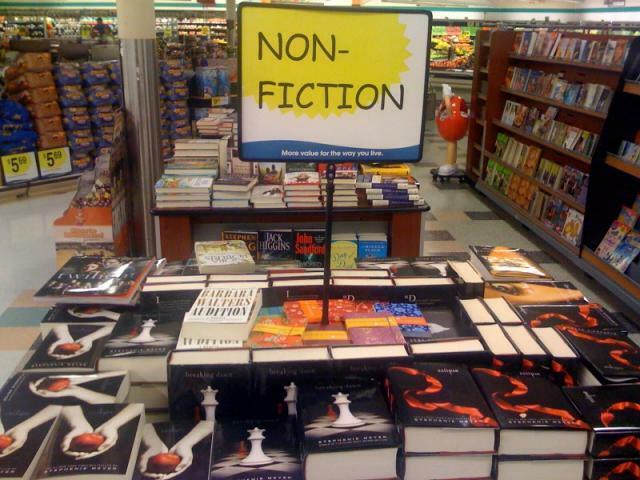 Exhibiting Twilight books under non-fiction category does NOT make you precious Cullens real! ;). Wallpaper and background images in the Critical Analysis of Twilight club tagged: critical analysis twilight fail cat anti. This Critical Analysis of Twilight photo might contain tindahan ng diyaryo, tindahang aklat, bookstore, puwestong-aklat, and silid-pambasa. Just kidding everyone, don't take it seriously. Where is New Moon? Oh, of course, they don't like New Moon because it has no Edward and too much Jacob. Sigh. OMGSH WHAT IS WRONG WITH THIS WORLD?! Now I know how corrupt this world is. I WANT TO SCRUB MY BRAINS OUT!! PLEASE in God's name, tell me that has been edited!! !